If you’re looking for a long-lasting solution for your flat roof, then EPDM is an option worth considering. 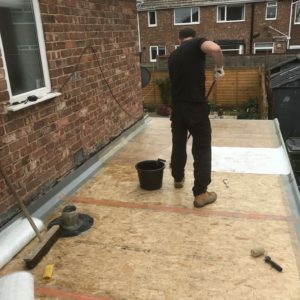 Our approved EPDM roofing contractors located across the North East are experts in the field of installing flawless flat roofing systems and have been fitting EPDM rubber roofs for years. 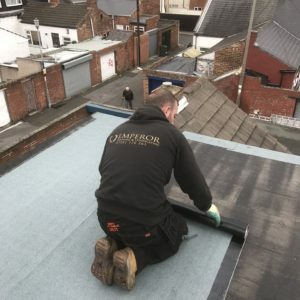 At Emperor Roofing, we work across Tyne and Wear, including Gateshead, Newcastle, Washington, Blaydon, Chester-le-Street, Sunderland, Durham and Middlesbrough – so if you live in or around these areas, then we can help you. 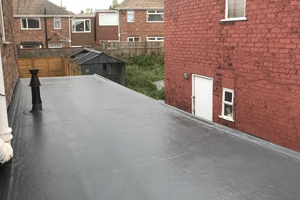 With flat roofs generally not covered under your home insurance policy, it’s important to choose a hard-wearing, long-lasting material when replacing your flat roof. This will not only give you peace of mind, but it can also pay for itself when you sell your home, by alleviating the concerns of potential buyers. Flat roofs have come a long way in recent years and so a modern replacement of your flat roof can eradicate many of the problems that have plagued homeowners for years. The materials, technologies and installation requirements have all improved, and an EPDM flat roof can boast a very long lifespan, with very little maintenance required. We take on projects of all sizes – no matter how big or small. Our 5* reviews show that we are trusted local roofers, and our first-class team offer both brand-new installation of EPDM flat roofs and roof repairs. We strive to use the best possible materials, so you can be sure your home has proper protection in all weathers. Why Choose Our EPDM Flat Roof service? What is an EPDM Flat Roof? A rubber or EPDM (Ethylene Propylene Diene Monomer) roof is a durable synthetic rubber membrane used on roofs worldwide. It’s a popular choice among architects, roof consultants and contractors alike as it can be suitable for roofs of varying sizes in almost every climate. EPDM roof systems are made from an extremely strong and durable composite material, which is easy to handle, light and flexible. This form of flat roofing has undergone a range of developments over the years, and now boasts a longer lifespan (upto 30 years) and less maintenance. Why choose Emperor Roofing to install your EPDM Flat Roof? 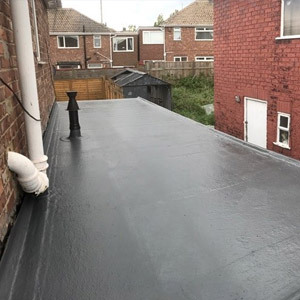 There are a huge number of reasons to opt for a rubber EPDM Flat Roof – they are long-lasting, easy to maintain and cost-effective. Most importantly, they protect your home from any weather conditions. As with any new roof installation, the biggest issues can occur when new roofing systems are not installed correctly. This usually happens when an inexperienced and/or unqualified roofer has been contracted to deliver the work. We are often called upon to repair the shoddy work of other companies. That’s why it’s important not to leave anything to chance when installing your new flat roof and to choose the right materials and tradesman to deliver the job. Where Can I have an EPDM Roof? With so many happy customers all over the North East, we’ve got proven results in EPDM roof installations. If in doubt, just check our Check-a-Trade and MyBuilder ratings. There are untold benefits to contracting an expert to install your new flat roof, along with peace of mind, first-class installation and use of high-quality materials. As flat roof installation is one of our specialities, we would recommend calling out one of our experts to your home for a consultation and quote. Our team will share tips on what to look out for, as well as answer any questions you may have regarding the installation. Our North East flat roofing specialities will ensure top-notch service from start to finish, with all initial quotes completely free. You can get in touch with our contractors by submitting your details in the contact form. Why go anywhere else when we provide a dedicated team of flat roofing specialists in EPDM systems? Do I Need to Replace my Flat Roof?